An ongoing Q&A between the author and himself. So you wrote a book, huh? We’ll get to that later. First I wanted to ask—When did you first decide you wanted to be a writer? Well . . . I always loved writing. Starting in elementary school, I would write poems and stories with the intention of making my family and friends laugh. Did any of those poems or stories get published? Interesting. So then what happened? When I was in college, I began writing on a more regular basis. Wow! Can I find any of that in bookstores? Not exactly. See, nothing from that time got published either. I’m starting to notice a trend here. Yeah, thanks for pointing that out. By the time I graduated from college, I knew I wanted to be a writer. The problem was convincing the rest of the world that I was a writer. I sent stories to journals and magazines and websites, but they all got rejected. So if you weren’t getting stuff published, what WERE you doing? It took me by surprise too. I’d gone most of my life without ever visiting Germany. Until I was in my mid-twenties, my German vocabulary was pretty much limited to two words: Ellbogen (Elbow) and Dummkopf (Dumb-head). Just the most important vocabulary. So how’d you end up moving to Germany? She lived in Munich, and crossing the Atlantic every time we wanted to see each other gets old fast. So I packed everything I could into a couple of suitcases and moved to Munich. While I was living there, we got married. Eventually, we decided to move back to New York. Brooklyn, this time. And all that time, you were still writing? Yep. I would sit down in front of the computer pretty much every day to write. Didn’t it get frustrating? You know, with the whole not-getting-published thing? It was extremely frustrating. But like most things in life, writing takes practice. Lots and lots (and lots) of practice. You have to do it regularly, every day if possible, even when you feel uninspired. So how did you start writing Jordan Droop? Uh, it’s called Joshua Dread. When I was living in Munich, I started reading children’s books in German as a way to improve my skill with the language. Because the vocabulary was simpler, they were easier to follow and understand. And from there, I began reading English-language kids’ books too. This was a change for me. I’ve always loved reading, but ever since high school, I’d read exclusively books for grown-ups. All of a sudden, I was reading kids’ books again, and it was a real eye-opener. I loved the emphasis on storytelling, the imaginative worlds that characters inhabited, the zaniness, the humor, the sincerity. But what does all this have to do with Jonathan Dwoob? It’s Joshua Dread! And after reading so many books for kids, I felt inspired to write one. So that’s what I did. And in a way, it was like when I was in elementary school, writing things to make my family and friends laugh. I wanted to write a book that was funny and original and full of adventure. That’s where Joshua Dread came from. Getting Published in 87 Easy Steps! The second installment in an ongoing Q&A between the author and himself. If you haven't read Part One yet, click here. So I was wondering . . . How long did it take you to write Jeremy Drab? 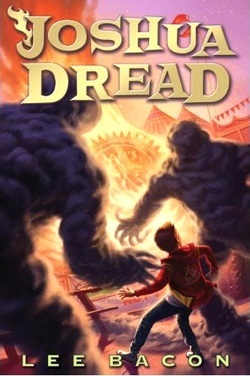 I told you already, it's Joshua Dread! And it took me about six months. And then you found a publisher? Not quite. After those 6 months, all I had was a rough draft. But the book still needed tons of work. So I went back and did a lot of editing and revising and rewriting, which took another 3 months or so. When I felt that the book was finally ready, I sent it out to a bunch of different literary agents. Hold up! What do a literary agents do? Bo-ring! Get to the point. Okay, fine. So I got a great literary agent. She read the book and helped me improve it. Then she sent it out to many different editors from many different publishing houses. And luckily, one of those editors wanted to publish the book! Tell me a little more about working with an editor? Defends the book when bullies try to steal its lunch money? Sorry. So what was it like having your book edited? At first, it was a little like being in school again. Getting the manuscript back from my editor reminded me of getting a paper back after the teacher’s gone wild with the red pen. Did I just flunk my own novel? Luckily, when I took a closer look, I realized that the marks on my manuscript were really smart and insightful in helping me to write the best book possible. After several rounds of this, the book was in much better shape. Then it was time for copyediting. What’s the difference between editing and copyediting? An editor focuses on the quality of the writing and the big-picture stuff, while the copyeditor is obsessed with accuracy, consistency, grammar, spelling…that kind of thing. All that just to write about zombie dental hygiene! I'll say! Well, that's it for Part Two. But we'll be back soon with another installment in our Q&A. The third installment in a Q&A between the author and himself. To start from the beginning, click here. How 'bout we kick off this portion of the interview with some IAQ? IAQ? What’s that stand for? If you could have a feather scarf made of any kind of feathers in the world, what kind of bird’s feathers would you choose? I don’t really know. That’s not something I’ve ever thought about before. Fascinating! From looking at you, I would’ve predicted turkey. Nothing. Moving on…What isn’t your least favorite way to prepare sandwiches, not including those that aren’t ungrilled cheese? I don’t even know what that question is trying to ask. Exactly. That’s why it’s so infrequently-asked. Can’t you just ask me something more normal? Well, for example, who was your favorite author when you were growing up? Okay then, Mr. Picky. We’ll do it your way. Who was your favorite author when you were growing up? As a kid, my favorite author was Roald Dahl. I especially loved James and the Giant Peach and The Witches: books that seemed too dark to have been written for children. Almost like the library made a mistake by putting the books in the “Children’s” section and I had to read them all as quickly as possible, before any grownups found out. Did you have any other favorite books when you were a kid? Definitely. Louis Sachar’s Wayside School series, The Chronicles of Narnia by C.S. Lewis, A Wrinkle in Time by Madeleine L'Engle , The Mysteries of Harris Burdick by Chris Van Allsburg and everything by Shel Silverstein. Do you still read kids’ books? Some recent children’s books that I like a lot include the Percy Jackson books (Rick Riordan), Diary of a Wimpy Kid and all its sequels (Jeff Kinney), A Tale Dark and Grimm (Adam Gidwitz), The Secret Series (Pseudonymous Bosch) and His Dark Materials (Philip Pullman). Do you have any advice for young people who want to become a writer someday? My advice is simple. Just write. Pretty much. I really do believe that the most important way to become a professional writer is to write as often as possible. Even if it’s just a few minutes a day. Find a time when you can sit down and write. A couple of paragraphs, a couple of pages. Whatever it takes. As long as you stick to it, you will get better over time. What if you don’t have anything to write about? That’s a problem everyone faces at times. Some days you sit down to write and nothing happens. One thing that helped for me when I was starting out was keeping a journal. For years, I carried journals around with me everywhere. And when I had a few spare minutes, I would open up the journal and start writing. Anything. I would write about what happened to me that morning. Or a girl that liked. Songs I was listening to. A movie I watched the day before. Dreams. Goals. Terrible poems. Things that annoyed me. Things that inspired me. There’s always SOMETHING to write about in life. Even if it’s what you ate for lunch that day. The important thing is turning writing into a regular part of your life. Do you still keep a journal? Not anymore. After a couple of years of writing in my journal nearly every day, I began writing more and more fiction. Instead of writing about things that happened in my own life, I started making up things about other people’s lives. Now I do that for a living. Weird, huh? Very weird. Tell me a little about your writing routine. Well, I’m a morning person, so I usually wake up early every morning to write. In the morning?!? That’s rough. Have you ever fallen asleep at your desk? Not yet. I sit down at my desk with a cup of green tea, so that helps. Most days I write for about three hours. How many pages do you write during that time? Depends. When things are going well, I can write four or five pages. Most of the time, the page count is closer to two or three. Other days I struggle just to complete one page. But I always end up making SOME progress. And over time, it all adds up—a little bit at a time—to a book. Well, that just about sums up the interview. I’d like to thank my guest, Lee Bacon, author of the book Jeffrey Doof. I told you, it’s Joshua Dread.